Are you considering adopting a pet? Rabbits make excellent house pets. They have endearing personalities and readily adapt to living with people, even in an apartment. 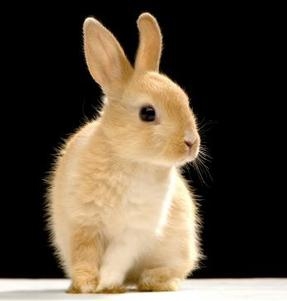 If you do choose to adopt this pet, do your research first to learn just how to take care of a bunny. You will want to know how to feed and care for your pet, as well as provide it with a comfortable home and play area. One of the first things in learning how to take care of a bunny is to make certain that your home is safe for and from the rabbit. Rabbits like to chew on things, so make sure that it can’t get to anything harmful. Many plants are harmful to rabbits, so keep all of them out of reach. Electrical cords are essential to protect, because if your bunny chews through one, it could be seriously hurt or killed. 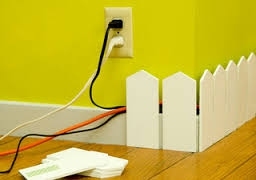 Here are a few ideas on protecting the cords. The easiest thing to do is to tuck cords behind the furniture or underneath rugs. This isn’t an entirely foolproof method, though. The bunny can slip behind the furniture, or chew the cord where it enters the plugin. Encasing the cords inside plastic tubing is a good way to protect them and your bunny. The plug end may not fit through the tube, but you can use a sharp knife to slit the tubing open, place the cord inside, then tape it shut in a few places. PVC piping is the strongest material you can use to cover your electrical cords. Again, you may need to either cut the pipe down the side to insert the cord, or cut off the plug end, thread the cord through the pipe, then rewire the plug onto the cord. The very best solution is to purchase commercially made wire-concealer strips that affix to the base of the walls. They will conform to the shape of the walls, being the most secure and unobtrusive way of all. This method costs more, but is worth the expense in the long run. How to take care of a bunny does include their cage. You will need to purchase or make a cage for your new pet. The cage needs to be at least five times larger than your bunny will be when fully grown. It should be large enough for the rabbit to stretch out full-length, high enough so it can stand up on its hind legs, with room for a litter box, food and water dishes, a cardboard box “bedroom,” and room to move around. 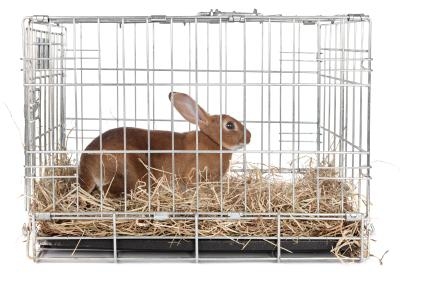 Choose a cage that has a solid floor and rabbit-wire sides. You don’t want one with a wire floor, as it will hurt the bunny’s feet. If that’s the best you can find, put a smooth piece of wood on the floor of the cage. Make the cage comfortable by lining it with hay, straw, or pinewood shavings. You can also find special bedding material made of recycled wood pulp. Bunnies like to make cozy nests for themselves, so be generous with the bedding material. Yes, your bunny can learn to use a litter box, just like a cat does. This is an important step in learning how to take care of a bunny. Put a litter box inside the cage so it will get the message. If you let your bunny have the run of the house, several litter boxes placed in various room corners will encourage it to use one rather than mess up the floor. Many rabbits like to just lie in their litter box, so make certain it’s large enough, and keep it clean. Don’t use cedar or other wood shavings, as these may cause liver damage or allergic reactions. Stick to organic materials like paper, wood pulp, or citrus. As with any pet, how to take care of a bunny includes making sure they have plenty of fresh water at all times. 75% or more of the bunny’s diet should be a good quality hay—timothy, grass, or meadow hay. Young bunnies need alfalfa hay for its protein and sugar content, but never feed alfalfa hay to an adult rabbit. Place the hay by the litter box. Rabbits tend to poop when eating hay, so this will encourage them to use the litter box. Your bunny will enjoy a variety of vegetables daily. Use only fresh vegetables that are free of pesticides. Contrary to tradition, you should not feed your bunny lettuce as it causes GI stasis. Broccoli leaves, celery, parsley, carrot tops, and watercress are good choices. Give your bunny a treat now and then. Fruit is a good choice, but don’t give too much because of the sugar content. Bunnies usually like apples, pineapples, bananas, raspberries, and strawberries. Feed rabbit pellets sparingly, and choose the ones that are low in protein and high in fiber. Limit them even more as the rabbit ages as they can cause obesity. In learning how to take care of a bunny, you should know how to pick it up. Never pick up your rabbit by its ears, tail, scruff of the neck, or legs. Bunnies are fragile creatures with weak skeletal systems. To lift a bunny properly, put one hand underneath its torso, one hand to balance it, and then draw it up close to your body. Their back legs are strong and with sharp nails, so be careful. Many rabbits don’t really like to be held, so if you need to pick it up, hold it firmly but gently to avoid injury to yourself. Choose a veterinarian that understands rabbits. When you first acquire your rabbit, take it in for a general checkup. After that, if your rabbit appears to be under the weather, or stops eating, take it in for an exam. Bunnies require regular grooming in addition to what they do themselves, especially when they are shedding. Intestinal blockage can occur if too much fur is ingested. Keep their nails trimmed regularly to avoid painful foot deformities. Unless you plan to breed rabbits for a reason, have your bunny spayed or neutered to improve its health in the long run. Your bunny should have some free time out of its cage each day. 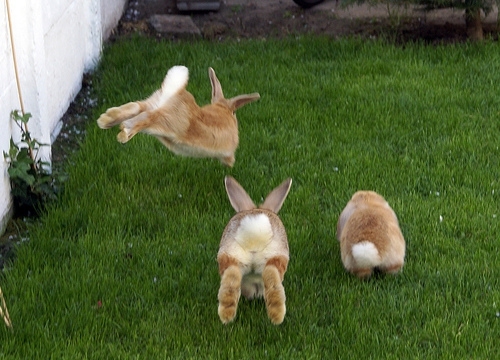 Bunnies love to jump around, run through tunnels, and play in and out of cardboard boxes. Cut a few bunny-sized holes in a cardboard box, put it in the center of a room, and enjoy watching your pet having fun. If you can, take the bunny outside into your fenced yard to get some fresh air.